600 at LGBT Rainbow May Day in St. Petersburg: Defying Putin! Our friend Ruslan Porshnev's fantastic news portal Queer Russia site this weekend is sharing photos and facts about lesbian, gay, bisexual and transgender Russians defying President Vladimir Putin's laws and rhetoric demonizing gay people, and taking the streets to express pride and demand liberation. 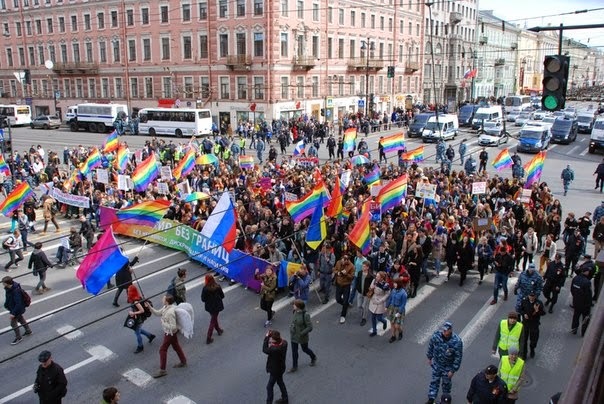 On May 1, Rainbow May Day march was held in St. Petersburg for the fifth year in a row, drawing hundreds of participants and guarded by the local police. The rainbow column was a part of a bigger Democratic March bringing together a number of trade unions, political and social movements to celebrate the International Workers’ Day. The march was held in the centre of St. Petersburg, on Nevsky Prospect. Media report the total number of participants over 90,000 with LGBT column itself consisting of around 600 people. Slogans and plackards of the LGBT column included such statements as “No to discrimination on gender and sexual orientation”, “Dump homophobia”, “I love, not war”, “Milonov, thanks for promotion”, “Milonov go to Uganda for homopropaganda”, “Sexism is so last century”. 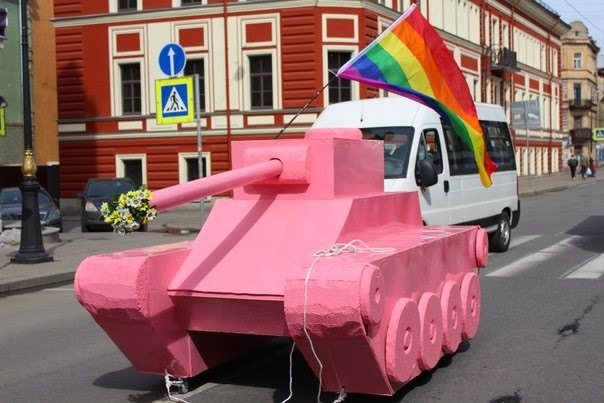 There was also supposed to be a big bright foam plastic pink tank with flowers inside its trunk to be carried along the procession, but police did not allow activists to do so due to technical problems in proper inspection. Vocal opponent of LGBT equality, local Legislative Assembly MP Vitaliy Milonov, United Russia party member, along with his very few supporters tried to disrupt the march shouting out offensive and rude remarks at participants. 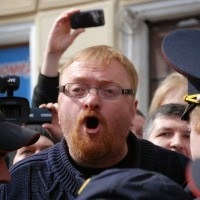 For example, Milonov asked police to give him permission to “tear head off” of one of the participants. He shouted: “Arrest them! Go away! Pedophiles! Prostitutes! Faggots! I am Russian! We will liquidate you! They should be squashed with tanks and tractors!” and so on. Milonov unsuccessfully tried to convince policemen that rainbow flags violate the “gay propganda ban law” because he brought his children along with him and they saw the flags that in his opinion promoted homosexuality to them. Nevertheless, policemen boldly refused to take any action on that claim and prevented Milonov’s disruptions. 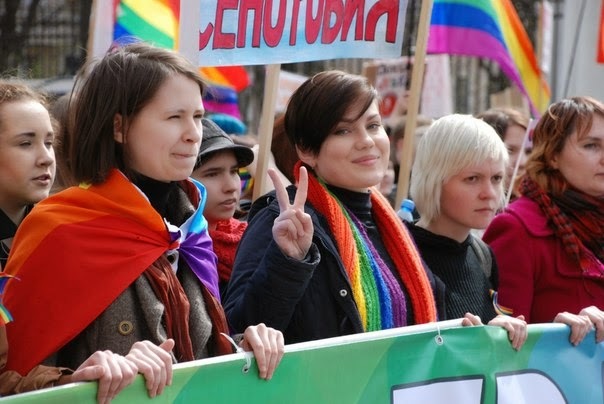 Rainbow march was organized by Vmeste Coalition for Civil Equality. Photos from Vmeste Coalition Vkontakte page.